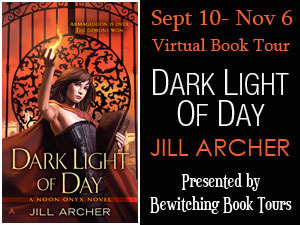 This Sunday we are the day's stop on the Dark Light of Day Blog Tour. This paranormal YA sounds great, features some unique concepts, and has a fantastic cover. 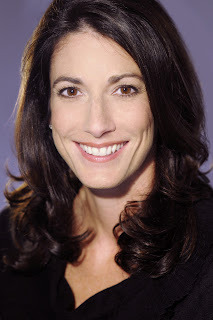 Author Jill Archer shares an excerpt with us and has written an excellent guest post on the healing women--the Mederies--of her novel. This tour is presented by Bewitching Book Tours and there are tour-wide giveaways for everyone to enter below. Because this is the Reader Girls Blog (an idea which I love, btw! 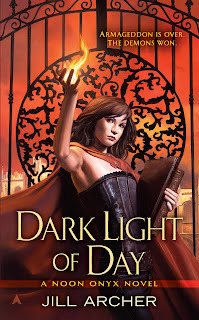 I have two young daughters too, although they're not quite old enough to start reviewing books with me :-)) I figured I would do a post about the noble women from my debut novel, Dark Light of Day -- the Mederi healers. Artemis: Greek goddess of wild animals and childbirth. (Hecate and Cassandra are two other excellent examples of "wise women" in Greek mythology with Hecate associated with magic, witchcraft, and herbal knowledge and Cassandra acting as an oracle or seer). The wise women in Dark Light of Day, my debut urban fantasy novel, are called Mederies. Where did I come up with the term "Mederi" for my wise women magic healers? According to the online etymology dictionary (one of my go-to inspirational resources), "mederi" means "to heal, give medical attention to, cure" (see the definition for "medical"). I also liked that the word "Mederi" reminded me of the name "Medici," the powerful, influential, rich, royal, European family that dominated their geopolitical sphere for centuries. (The House of Medici produced four popes, two queens, and was a patron of art and architecture during the Italian Renaissance). Dark Light of Day takes place 2,000 years after Armageddon, the last great battle of the Apocalypse. Lucifer and his Host army won (barely) and, in modern times, the army's descendants rule a country called Halja. The male descendants of Lucifer's warlords serve as demon peacekeepers, or modern day magical knights, and the female descendants serve as Mederies, or magical midwives and healers. In creating Halja's Mederies, I incorporated many aspects of the wise woman archetype (they work with magic and herbal remedies and they are women who work closely with other women), but I chose to ignore other aspects (they do not have the gift of sight, nor are they seductresses). In short, I focused on "the healer" and "mother figure" aspects of the wise woman archetype. Two score and five years or so ago, my mother, Aurelia Onyx nee Ferrum of the Hawthorn Tribe, had been the most beautiful and powerful Mederi the south bank had seen in at least three generations. She’d cured countless diseases, scoured scores of unnamed pestilence, helped crippled children walk again, and the blind to see. She’d birthed hundreds of babies, healed new mothers, and brought blue babies back to life. No one miscarried with the young Aurelia Onyx attending. She’d been a superb midwife. Not only beyond reproach, but a shining example of what all young, dutiful Mederies aspire to be. Her garden had been legendary. Bluebells, bog lilies, and cattails had bloomed next to sand verbena and prickly pear. Wisteria blossomed next to bougainvillea, passion flowers sprouted amongst sea holly, four o’clocks opened at dawn, and the night-blooming cereus flowered not just on midsummer’s night, but every night of the year. People never spoke directly to me about it, but I’d gathered that, in its heyday, my mother’s garden had been something of a fertility shrine. Hyrkes­—humans with no magic—came from as far as the New Babylon suburbs just to spend the day in it. Losing a day’s work and traveling for hours was nothing in trade for the chance to soak up all that life and to possibly see her. Or even to have her touch you. Because Aurelia Onyx had had the gift of life. So, readers, how about you? Are you as fascinated by the wise woman archetype as I am? Do you have other examples of this archetype to share? Who's your favorite doctor or nurse character from books, movies, or television? Out of all of the examples listed above, which wise woman would you go to for help or healing? Want to hear more about women witches and healers? See the article here. A big thanks to Laurie, Meghan, and Caitlin for inviting me to guest blog here today! 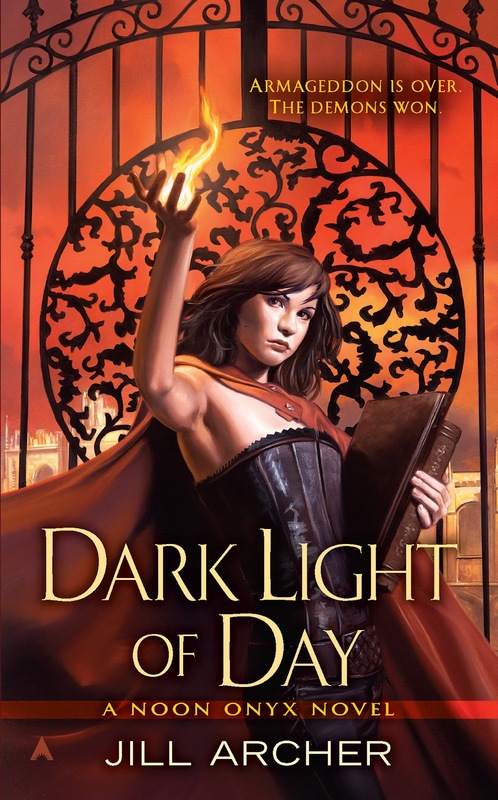 I'm grateful for the opportunity to share more about Dark Light of Day and its wise women! For the complete tour, go here. $10 eGift Card (either Amazon or Barnes & Noble, winner's choice) to be drawn at random from all blog tour commenters. $10 eGift Card (either Amazon or Barnes & Noble, winner's choice) to the person who brings the most people to the party. To enter to win this one, tell a friend about the tour (someone who hasn't yet commented). You'll be entered to win when your friend stops by at any spot on the tour and tells us that you told them about the tour. This book sounds like an interesting read. A world where the Demons won-what a unique plot! Thanks for the giveaway!!!!! Hi Lindy, DLOD is unique, that's for sure! :-D Thanks so much for stopping by to check it out. Good luck with the giveaway! I read THE CLAN OF THE CAVE BEAR by Jean M. Auel not that long ago actually. So Ayla is fresh in my mind. Florence Nightingale always shone bright in my mind ever since I learned about her in school. Hi Marybelle, I've read all the books in the Earth's Children series except the last (only bc I haven't had time). I loved them. Thanks for the comment! Hi everyone, I hope you're all having a great Sunday! I wanted to clarify that DLOD isn't paranormal YA. It's adult urban fantasy. While I think readers are capable of deciding what their preferences are, I also think it's the responsibility of authors, publishers, parents, librarians, etc. to provide information to readers that will help them make their decisions. So I just want to let everyone know that the suggested reading level is 18 and up. That said, it's interesting that this subject came up. I just finished writing an article about the emerging "New Adult" genre and whether DLOD might be NA. (I'm honestly not sure). Noon is a 21 year-old post grad magic user and the story's main focus is her academic, romantic, and career choice struggles. The book definitely has a more youthful tone than some of the other urban fantasies out there, but the worldbuilding is quite detailed and the setting is not contemporary. The conclusion I reached in the article was that readers would likely be the ones to decide where DLOD best fits. In any case, I'm thrilled to have the opportunity to guest blog here today. My oldest loves to read and was fascinated by the idea of this blog. She's currently reading THE TRUE CONFESSIONS OF CHARLOTTE DOYLE and is really enjoying it. the book looks really interesting! Hi Laurie-- Thanks! Hope you're having a fun Sunday! The book sounds great Thanks for the chance to win. Hi Crystal, thank you! Good luck with the giveaways! Yay!! Thank you for the giveaway :) For me my favorite Doctor is from Doctor Who ,Tv show, The Doctor he is a man that travel in time and space, I love him. As for you book the more I read about it, the more I love it. I really hope I win, I will get this book no matter what. I just want to test my luck. :) I hope there is more of this series. Terry Goodkind had an interesting version of the wise woman in his Sword of Truth series. She cold see the futute and acted to prevent terrible events from happening. However, her interpretation of the things she had forseen was always off, and she was more of a well-meaning antagonist than a counselor. That's what you get for messing with the future, I guess. WINNER: Lindy Gomez, you won the Ace/Roc sf/f sampler I'm giving out at this stop. Please e-mail your address to: archer at jillarcher dot com. To the Reader Girls and their readers, thanks again for hosting me! I enjoyed this stop. Best wishes and happy reading!! This sounds very good! Thanks for sharing and for the awesome giveaway! Looks great! I would love to read it.